Laser hair removal is a safe way to remove unwanted body hair with long-term results. Laser hair removal results are not permanent; however, when hair does grow back, it is less in volume, lighter in color and finer than it was before. The Dermatology Center for Skin Health uses the G Max Pro® system to effectively treat all caucasian and ethnic skin types for hair removal. 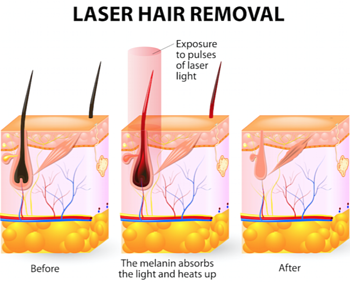 The laser used for hair removal is a pulsating beam of lights that passes through the skin to the hair follicles. The heat of the laser causes damage to the hair follicle, which inhibits hair growth. Before starting the treatment, you should meet with your doctor or nurse practitioner for a consultation to discuss current medications, health history, expectations, benefits and risks. You will also discuss cost and number of recommended procedures. You should avoid the sun, sunless tanning products, waxing, electrolysis and plucking. Other type of hair removal methods could interfere with your treatments. Shave right before the treatment, so that the laser will not come in contact with hair growth above the skin. Moisturize your skin before treatment. It is common to see red bumps post-treatment; however, moisturizing your skin prior to treatment can help sooth the area and repair it quicker. Exfoliate your skin before treatment. This can remove dead skin cells that cover your pores and prevents new and healthy skin cells from forming. Dead skin cells on the surface of the skin during treatment can prevent the hair from shedding and make the procedure less effective. During the procedure, you will have the area cleaned and wear protective eye wear. The clinician will prepare the laser. Treatments can last anywhere from five minutes to an hour, depending on the size of the area. After the treatment is finished, follow this list of do’s and don’ts to help you remain comfortable. After the treatment, you should not exercise for a minimum of 12 hours, shower for 12 hours, use irritants for seven days, tan, pluck, wax or undergo electrolysis. You should apply sunscreen, moisturizer and gently exfoliate the area two to three times per week. You may also apply ice to the treatment area to increase comfort. Individuals with light skin and dark hair are the best candidates; however, the G Max Pro® system can effectively treat all Caucasian and ethnic skin types for hair removal. The laser has a difficult time targeting white, gray, red or blonde hair follicles. Results can be immediate. After the first treatment, expect a 10-25% reduction in hair. As mentioned above, the number of treatments recommended vary on the area and area size; however, most patients need approximately four to eight treatments to achieve optimal results. Patients usually do not see hair growth for months, sometimes even years. Occasional “touch ups” may be required. There is no damage to the skin, only the hair follicle. The skin in and around the area could become red but only temporarily. Laser hair removal can take multiple treatments, depending on the location and size of the area. Last but not least, this procedure does not long treatment time. The time varies based on the area and size; however, each session should take less than one hour. DOES THIS HAIR REMOVAL TREATMENT ACTUALLY WORK? We understand your skepticism, but laser hair removal does work. If a patient follows the treatment plan, and completes maintenance sessions, laser hair removal can be effective for them. At the Dermatology Center for Skin Health, we are dedicated to providing our patients with top quality care. Laser Hair Removal services should be done with a qualified dermatologists, nurse or clinician. If you are ready to discuss laser hair removal, call 304-598-3888. Download our Laser Hair Removal ebook for even more information.